PACESETTER is rapidly gaining popularity as one of the most consistent and proven Optimizer bulls available. 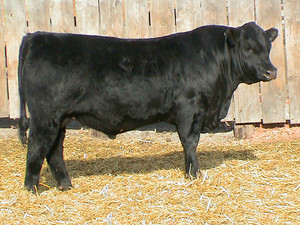 He was the high-selling bull of our 2005 sale and sired a member of our 2005 National Champion Pen of Optimizer Bulls. PACESETTER is a very well-balanced and attractive bull with a phenotype that features tremendous length of side, a long hip and a powerful quarter that carries deep down into his hock. He is the largest ribeye bull we have ever measured in 8 years of collecting ultrasound data and combines it with an impressive IMF reading. We have sold 3 sons of his very productive dam in the last 3 years for an average price of $5500.